Top financial performers invest in digital at a rate much higher than their peers, according to data released Tuesday. Some 66% spend 10.1% or more of revenue on digital, compared with 26% of their peers. Nearly three-quarters say the investments help to improve talent retention and recruitment, compared with 26% of their less financially successful peers. 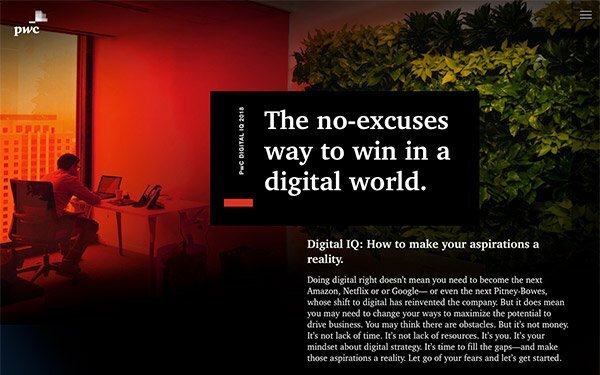 The PwC 2018 Digital IQ Survey was fielded from January through March 2018 and included 2,280 respondents from more than 60 countries. About 61% of the respondents work in organizations with $1 billion or more in revenue, and 24% have revenue between $500 million and $1 billion. About 80% of survey respondents say they are making investments in maturing technology. About 80% cite mobile, followed by 70% for cloud computing, and 55% who cite investments in the Internet of Things. Some 86% say digital technology enhances the company’s brand and reputation, compared with 31% of others. About 68% acknowledge that it has resulted in better decision-making using data, compared with 41% of others. And 65% say it is creating better customer experiences, compared with 28% of others. Among respondents, others cite increased profits and making it easier to compete with new companies entering their market. About 49% of survey respondents say their company uses technology to identify new growth areas. Forty-eight percent say they use it to identify new markets, and 36 point to increasing the speed of innovation. About 64% of survey respondents said their companies spend at least 5% of annual revenue on digital, with 71% acknowledging they are aware of their company’s digital process. But it is mostly pressure from competitors that keeps companies on track. Some 23% of respondents said the pressure from competitors was the most important reason they need a digital strategy. While 19% cite technical maturity, 12% said market intelligence influenced their digital thinking. Pressure from competitors and the need to become more tech savvy within the company seem to drive digital transformations at companies. Some 38% of respondents point to competitive pressures, 38% point to technical maturity within the company, and 23% point to market intelligence as being the factor influencing change. Time and a company’s structure are the barriers for increasing the skills of the workforce, according to the study’s findings. Digital also helps to improve the customer experience, which has become critical for brands. About 65% cite business performance, while 70% cite digital transformation. About 76% have an executive in charge of customer experience, and 73% believe they have effective customer experience strategies. Some 32% say they manage customer experience through a department and 31% use a specialized team.